The growth of the natural hair community over the past ten years has been phenomenal. We've grown from a handful of hair bloggers in the early 2000s to thousands of YouTube vloggers in 2015. A simple Google search confers hundreds of articles on how to grow and maintain naturally curly hair. 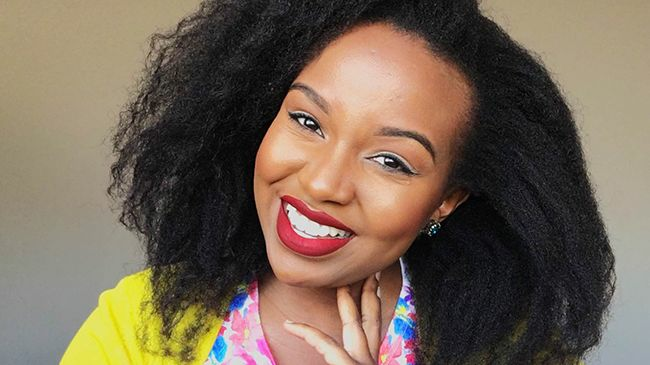 There's no denying that anyone that's eager to grow out their natural hair now has all the information they need at the touch of their screens. However, if you are new to natural hair care, sifting through all the information online sure can seem daunting. You'll have to have lots of time on your hands to get a grasp of all the information that is out there. With differing opinions on matters as basic as how to detangle your hair, you might find yourself overwhelmed and confused. This is precisely why I put together my Back To Basics With Craving Yellow YouTube series. In this information-packed series, I share my top tips on how to kick-start your journey to long, healthy, natural hair. Each 1-3 min. video is tailored to give you clear and straightforward responses to these ten foundational natural hair questions. The most foundational question of all. I share what my own journey has meant to me as well as all the amazing healthy hair results I've experienced as a natural. You can either big chop or to transition. I get into the pros and cons of each and share my own experience. I thought I'd last two years with both textures, but after eight months I wanted my curls so bad, I grabbed a pair of hair shears and snipped my relaxed ends off. I truly believe that the most foundational practice of natural hair care is a healthy hair regimen. There's no way out of this one, if you're after a full healthy and luscious mane, you must commit to this practice. The rest of the series offers step-by-step guide on how to build your regimen. Cleansing our hair is absolutely critical to the overall health of our hair. However, cleansing products can be some of the most detrimental to our hair's luster. I explain this paradox and offer some useful techniques on how to effectively cleanse your strands. I offer some simple pointers on how to use deep conditioning to maximise moisture retention in your strands. I also suggest some simple and effective methods to strengthen your strands using hydrolyzed protein. I share some tips on how to seal your cuticles using coffee and tea. Turns out these hot beverages are effective on our hair. I also talk about the much loved LOC method and why you should use it to seal in your hair's moisture. In this section, I argue that there's hardly a reason why you should use heat on your natural hair. If you want to stretch your hair, braid it in three strand braids, and then take them out. Direct heat is the enemy of length retention. Avoid heat like the plague. Here, I demystify the myths that some products can grow or soften your hair. I argue instead that in order to know whether or not a specific product will work on our hair, we need to read the ingredient lists. I suggest that you keep your hair in a long term (4-6 week), low manipulation styles such as two-strand twists. I also explain why I stopped wearing braids with extensions, and the difference this has made for my length retention. In this section, I differentiate between shedding and breakage, then offer some easy steps that you can take to minimise breakage. Remember, the less your hair is breaking, the more length retention you'll see. What questions do you have as a new natural? What do you find most difficult about navigating all the information online?